This is a story about a nice surprise for pandas and the people who love them. It started with the most comprehensive survey ever done of China's panda population. Long treks into remote places using high-tech gear to place and count the pandas. And when they added up the numbers, that was the surprise. Not the 1,000 or so pandas once believed left in China, but 1,600: a whole lot more than anyone expected, reports CBS News Correspondent Barry Petersen. How did this happen? That depends on who you ask. The World Wildlife Fund, which helped run the survey, says that maybe previous teams didn't go far enough into the wild to count all the pandas. The Chinese, to whom the pandas are a national treasure, offer a different reason, that their decades of study and helping pandas reproduce in captivity using everything - including artificial insemination - is paying off. 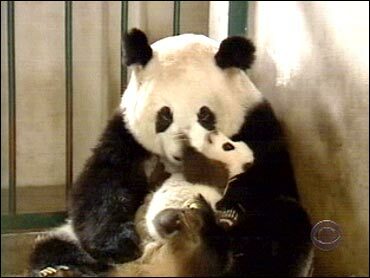 More intensive care, more pandas. But it doesn't stop there. It turns out the pandas, notorious for not reproducing in captivity, do just fine when nobody's looking. "If there are good conditions for panda survival, the population will actually be able to bounce back," says Jim Harkness of the World Wildlife Fun. "We know they reproduce in the wild if they are left alone." If their wilderness is protected, pandas will likely continue to flourish amid the bamboo plants they so love to nibble. So forget about the world's bad news for a moment and just think - one of the worlds oldest and grandest creatures is making a wonderful comeback. And all we humans have to do to help out basically get out the panda's way.